It's short and not so sweet; something here reminds me of the still photograph experiments of Eadweard Muybridge, in his continuous photographs of a single action that, when seen in rapid sequence, replicates motion. We can see the cat padding about cautiously as it tests its balance on a precarious edge, we can sense the progress, stanza to stanza, the halting placement of the forefoot, the comedy of hind leg stepping into an empty flowerpot. This artfully , succinctly condenses visual information to essential actions , creating the feeling of the excited, rapid commentary of one friend nudging another to view a comic vision. One nudges the other, whispers "get aloud of that ". Longer digressions are left behind, compound words and their alliterating implications are left on the work bench. Word selection and length are everything, and the goal for Williams, I think, was to create a sense of the event happening in real or recent time, detailed with words that are fresh and pure of post-reflective abstraction. He hasn't larded up the perception with cracker barrel philosophizing. 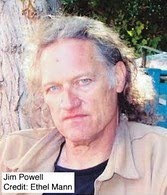 Jim Powell accomplishes much the same effect as Williams, although he isn't as temperamentally taciturn as the late poet was. He does have, though, a strong sense of the lyric move and succeeds, in his his strongest work, of knowing when the lines break, when the image commands the center of the work, and when the narrator's rumination filters through the descriptive arrangements, an insertion of a personality that sufficiently problematizes his subject. It's a delicate balance of the objective, the correlative and the subjective. It's a nice seduction, when the writing hand isn't over eager to deliver a payoff. Ah, but this is a crisp description of a delicate scene; like Williams, the concentration is on closely observed movement, the cupping of the male's hand to form a lift, a bridge for the woman to place her foot, the slow rising from the floor toward the sky, the final, cascade-seeming leap. What Powell has assumed from Williams are lessons well learned; the brief lines are an internalized beat, a slowly wound spring tensing up until an eventual, ceiling-bound release--the motions here are a seamless stream without the bumps and segmented grating a stitched-in abstraction would have brought to Powell's elegant outline.